Runners, walkers and health enthusiasts will kick up their sneakers when they see their beloved treadmill on the Christmas tree. 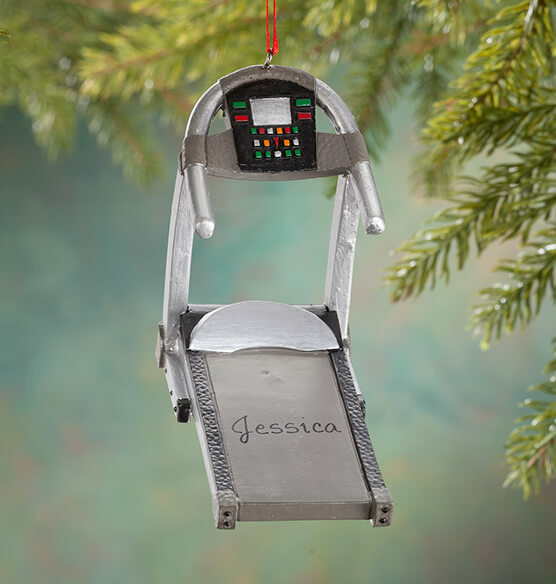 Exclusively designed and detailed all around, the 3D personalized Treadmill ornament is fit for all kinds of fun ... whether celebrating the avid athlete or inspiring the fitness newbie on your gift list. We'll go the extra mile on a thoughtful touch—personalizing with name and any year. Specify name; limit 1 line, 12 letters/spaces. Specify year; limit 4 characters. Resin. Christmas ornament measures 4" wide x 2" high. It's a Christmas ornament to hang on the tree. It represents what my daughter did this past year so is appropriate. I purchased this treadmill ornament several years ago, for myself, and even tho' I changed treadmills; I still have this one on the new treadmill, to motivate me, to stay on the "right track". Excellent gift for one that runs, or "loves their treadmill", like I do! This was a hard to find ornament so I was happy to find it here. It was much bigger than I expected and kind of big for an ornament. The writing on the ornament was ok, nothing fancy and on the big side as well.